BAE Systems has successfully completed a series of gun fire trials of its 155mm long-range land attack projectiles (LRLAP) at White Sands Missile Range in New Mexico, US, with a critical design review phase scheduled to start in December. During the latest round of flight tests, which met all relevent requirements, the rocket-assisted, gun-launched, and global positioning system (GPS) guided projectile demonstrated its ability to achieve accurate reliable and affordable long-range hits on target. The tests also validated the LRLAP tactical rocket motor’s performance under various conditions such as ambient, cold and hot temperatures, as well as live-fire performance of the tactical warhead. BAE Systems Vehicle Systems acting vice president and general manager Steven Schultz said: "This is a critical step forward for the US Navy’s 155-mm LRLAP programme. "BAE Systems continues to progress on track for our qualification to support deployment of the advanced gun system onboard the DDG 1000." The LRLAP rocket-assisted guided projectile will support land-attack operations onboard the US Navy’s DDG 1000 Zumwalt-class guided missile destroyers. Capable of striking against variety of targets in multiple mission areas, LRLAP can serve as an affordable, ship-launched alternative to currently used missiles for expeditionary forces. Designed to support land-attack operations, each of the DDG 1000’s two advanced gun systems (AGS) will be capable of firing more than ten LRLAP rounds in a minute. Featuring a GPS-based guidance system and a unitary warhead with an adjustable height-of-burst or point-detonation fuse, the weapon can be launched using a unique propelling charge. After demonstrating its performance and reliability in various conditions, the projectile is expected to achieve initial operational capability in 2016. 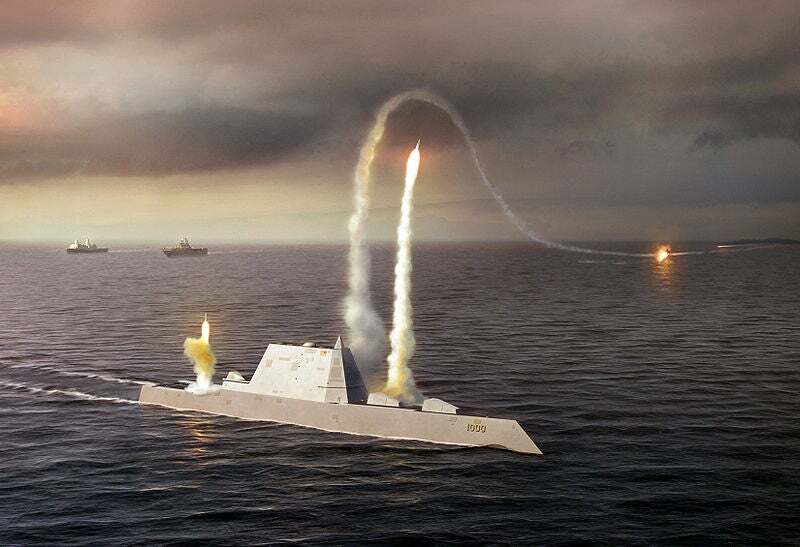 Image: A depiction of the USS Zumwalt class destroyer (DDG-1000). Photo: US Navy photo illustration/released.